As you likely know, there’s a new Mass Effect game in the world (as of last week). It’s received a lot of negative response online, but mostly positive reviews - though they’re not exactly glowing. So what are we to make of this? 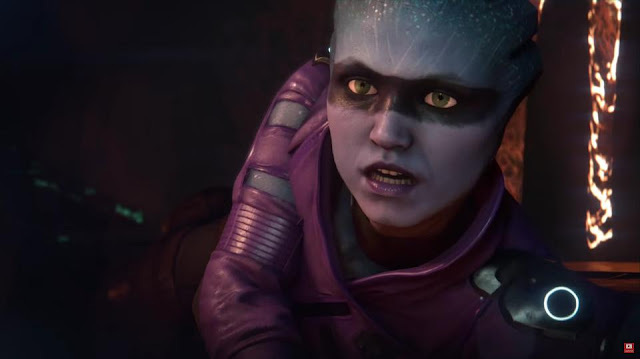 Here’s some impressions for those who were on the fence or were holding out because there’s still some deep-seated anger over Mass Effect 3’s ending. For the most part Mass Effect Andromeda does restore some good will after the debacle that was the resolution to the previous trilogy. It avoids dealing with that outcome altogether by sending a vast number of people of all races (though not everyone has arrived yet - I assume more will arrive in future DLC or in another installment altogether) on an exploratory journey to the Andromeda galaxy sometime before the events of Mass Effect 2. There are very minor references to a couple of characters in the past games, but they’re few and far between and won’t hinder anyone who hasn’t played the past games in any way. The important part is this is a fresh start, far from the events of the last series. In a lot of ways MEA feels like the culmination of everything Bioware has learned (and some lessons they didn’t learn) from past Mass Effects and Dragon Age Inquisition. 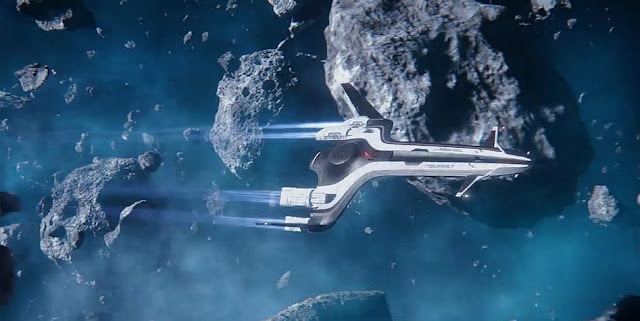 It feels like Mass Effect 1 in the way you are meeting a new crew, getting comfortable with a new ship and exploring new worlds (complete with a drivable vehicle). It even brings back a more complex inventory system, and like the one in Mass Effect 1, it’s somewhat poorly designed and difficult to navigate. Mass Effect 2 is represented in the form of loyalty missions. The excellent combat from Mass Effect 3 is back and built upon in interesting ways with things like a jump pack and swappable profiles. However I have been disappointed that Bioware essentially got rid of squad controls in combat. You can still tell your two squadmates where to go, but you can’t equip them with upgraded weapons and armor. Nor can you assign a target for them to hit with a specific power, which severely limits the importance of your squad composition. Having said that, for better or worse, your squad feels more than capable of handling themselves in most situations. Nevertheless, as good as combat is, it feels like something is missing. On top of all that, there’s gathering resources and establishing settlements that feels like it was pulled straight from Dragon Age Inquisition. Planet scanning and mining is back but in less egregious form (everyone’s least favorite part about the original trilogy). But because we’re exploring, charting, and settling in a new galaxy, it finally makes sense, even if at times it still feels like busy work. Generally speaking, MEA feels like it’s taking the series two steps forward but one step back with just about everything it does. There is also a Dragon Age Inquisition war table style mini game that involves sending strike teams to do tasks for you. Completing them grants you in game rewards, but it takes several hours worth or real time to complete (but since it’s happening in the background it’s never an issue). You can even assign these missions from Bioware’s Apex mobile app, making it feel like you are continuing to actively participate in the ME universe while you're away from home. Also, some of these strike team missions are playable in the form of MEA’s cooperative multiplayer mode. Tying the cooperative multiplayer mode into the Apex strike team stuff in this way was a smart move. It keeps the multiplayer feeling like an extension of the story without forcing players to take part in it in order to get a desired outcome at the end of the game. In fact, you are completely free to ignore the strike teams and the multiplayer altogether if you feel so inclined. The main storyline and the quests you do for your squadmates and other allies are all pretty interesting and certainly make up the bulk of why you play the game. The side quests, many of which are lumped into a generic “tasks” folder largely amount to little more than fetch quests that many will dislike or ignore completely. They do, however, contribute to more fully fleshing out the new galaxy and the people now living in it. That’s thanks in no small part to the sheer amount of dialogue in the game. Even minor NPC’s tend to have a fair amount to say. Conversations that may have had only a few lines and a pair of possible responses now have an entire wheel of responses, many of which are questions that lead to even more dialogue. All that dialogue means you’ll be spending a lot of time talking face to face, which leads me to the big question everyone wants to know. “How are the animations?” The internet memeified and joked relentlessly about the poor facial animations and other generally wonky animations in the week leading up to the game’s release. And perhaps that’s deserved, some animations are a bit glitchy and at least a few facial animations leave something to be desired, but they’re not as bad as you may have been lead to believe. At worst, they’re generally expressionless in ways that don’t match the mood or content of what’s being spoken, but I quickly learned to live with the few that were noticeably bad because of the strength of the characters and story. And if we’re being totally honest, it isn’t as though other big character and story driven RPG’s, with so many characters with spoken dialogue, are free from glitches and occasionally underwhelming facial animations (even past Mass Effect games are guilty of this, as well as Bethesda’s open world RPG’s like Elder Scrolls and Fallout - all of which I loved in spite of their glitches and graphical shortcomings). Another early complaint was with some of the dialogue that could occasionally come off as corny. While on occasion that was true, more often than not if the dialogue was corny, it was supposed to be. Some characters were written to be awkward while you were getting to know them, and usually those corny lines don’t go without being acknowledged as such by other characters (or even the ones that said the lines). A character lifts an invisible glass to take a drink during a minor cutscene involving a conversation with an NPC. Started conversations multiple times in which a character continued walking around the room instead of stopping to talk to me - the dialogue went on with my character talking to an empty corner of the room. Exiting the dialogue and reentering always fixed the issue. While on a planet, drove to an objective marker where I was supposed to talk to someone but there was no one there. I saved and reloaded and the people that were supposed to be there were there. One time I was supposed to clear an area of enemies before I could move on to the next part of a quest, but an enemy had fallen into the environment where I couldn’t get to him. I fast travelled to a nearby location and ran back to the area in order to get the enemies to respawn. I was then able to complete the quest. Yes, MEA suffers from a lack of polish (another 6 months of development time and perhaps a beta or two could have done the game a lot of good), but generally speaking it’s still very playable, and the good far outweighs the bad. None of the bugs and glitches are game breaking in my experience, and hopefully Bioware can fix a good number of them with patches (they’ve been good about updates and DLC in the past). There are also little bothersome things, like not being able to access your inventory and change loadouts on the fly (even if you just found a new weapon or piece of armor while exploring), that makes the game feel old fashioned by comparison to other modern RPGs (as if the game came out around the same time as the past Mass Effects). That may be technically more realistic, but it's needlessly inconvenient. Yet these things aren't the sort of thing that should keep you from playing Mass Effect Andromeda, especially if you have any sort of fondness for the original trilogy (even if you hated the ending of 3). For long time fans of the series there is also a somewhat lack of diversity in the game by comparison to previous games. 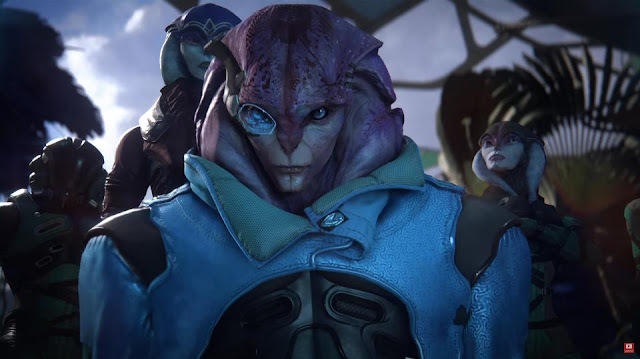 The main council races (Asari, Turians, Salarians, and humans) are there along with the Krogans, but there's a good number of missing races. The absence of some makes sense given the context. Still others are said to be “on the way,” which may be hinting at future DLC. Obviously many of these were never going to travel to Andromeda in cooperation with the other races, but certainly some of them may have. It really just demonstrates the diversity and creativity put into the original trilogy. Each of the races had interesting histories and interesting interactions with the main character. In their absence (and to populate an entirely new galaxy) the team at Bioware dreamed up just two new races - the villainous Kett and the friendly Angarans, though there is also another mysterious race of synthetic life forms called the Remnant. It’s a shame there wasn’t more of an effort to populate this foreign galaxy with a new collection of interesting races to meet and learn about. The theme of finding the human’s place in a galaxy full of aliens who’ve already established a governing body without us was one of the more compelling things about Mass Effect 1. It could have been that much more interesting here with such a vastly diverse Nexus of people trying to find their way among an equally diverse new set of races. With all of that said, there is still a lot to like here. The aforementioned two steps forward, one step back Bioware did with this game still manages to make it worthy of the positive reviews it’s received. Even if it only barely earns them. In fact, I’d be mad about it’s shortcomings if I weren’t enjoying myself so much with the game. I love that this feels like “classic Bioware” (Mass Effect 1 era if that counts for anything). I’ve made my peace with the negatives, and now that I’m passed them the game is rewarding me with an interesting story, likable characters, fun combat, and the promise of more Mass Effect. Just... maybe... don't play as the default Sara Ryder. Something didn't go well there. Choose to create your own face for Ryder. Or play as default Scott Ryder, if you're too lazy to make one. He looks fine. 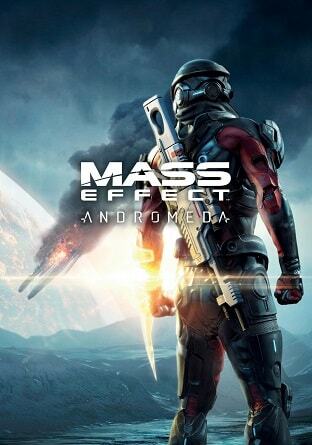 There are few science fiction universes as cool, interesting, and well fleshed out as that of the Mass Effect series. There is a reason it has such an ardent fan base. If you’re a fan of science fiction there is a big galaxy to get lost in here, and it’s full of interesting characters and tough choices to make.